Get free shipping on all orders to any place in the world. Shop Now! Get $30 discount to any painting with code 30peroff at checkout. Hurry Up! Shop Night Magic - Original Oil Painting On Canvas Today special price is only $149 including shipping anywhere in the world. Afremov is mainly known as being a self-representing artist who promotes and sells his work exclusively over the internet with very little exhibitions and involvement of dealers and galleries. Struggling for his individuality and artistic freedom, he managed to create his own style based on the experience of the most outstanding artists. While Afremov’s early works are influenced by the masterpieces of older painters, his mature artwork is very unique and recognizable. 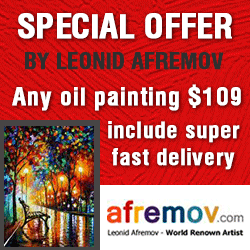 Found a coupon for Afremov?